His first challenge was the Passo di Valparola (2,192m – profile) which turned out to be a near perfect climb. Not too steep with an average gradient of around 6% and therefore a perfect warm up for the Giau. On the descent, around 80 meters lower, he ‘crossed’ the summit of the 3rd climb he had planned for the day, the Falzarego. But first, he continued the descent towards Caprile, missing the turn at Andraz (he had to get back up for about 2 – 3 kilomteres or so). In Pocol he jumped to the climb of the Passo de Falzarego (official start in Cortina, but on the profile, you see ‘bivo x Passo Giau’) – this climb is similar to that of the Valparola and it was a good one to finish the day with: a 581 altimeter gain in just over 11 kilometers. Total for today: 71.3 km / 3,654 altimeters. 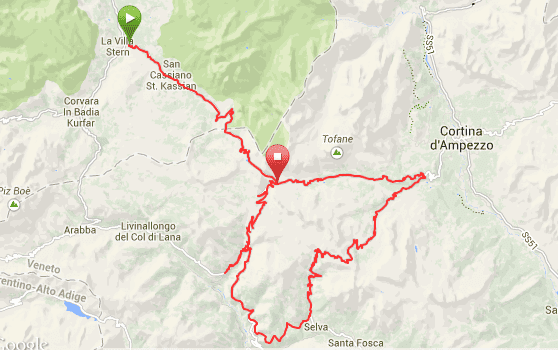 Tomorrow the Sella Ronda Bike Day, with four passes and a total of around 60 kilometers.